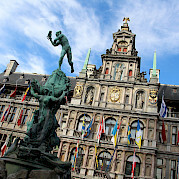 Experience an unforgettable bike tour in the green heart of Western Europe. The route is nicely designed and follows bicycle paths and tranquil back roads. 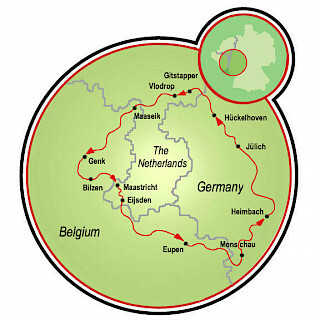 For most of this Europe bike tour, navigation is made easy with the cycling-by-numbers system. 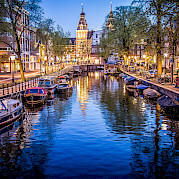 This cycling adventure will prove to be unforgettable as you pedal through three National Parks: Hoge Kempen in Belgium, Eifel in Germany, and De Meinweg in the Netherlands. 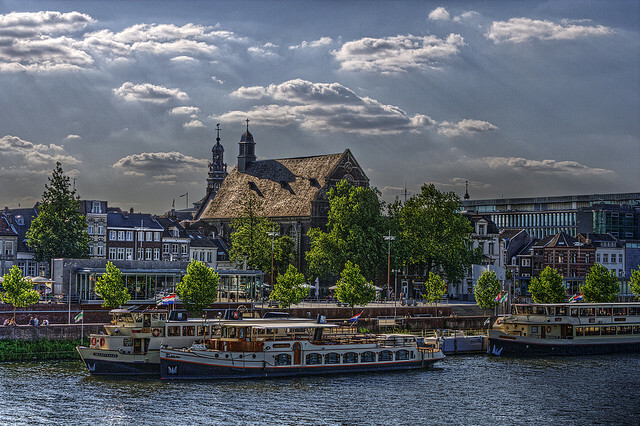 You will roam past famous abbeys and castles, visit Maastricht and Monschau, and enjoy the bike path along the River Roer/Rur as you cycle through woods and heather fields. If you're worried about the climbs in the High Fens and Eifel, you can always rent an e bike! After a day of cycling, enjoy accommodations in excellent 3 and 4 star hotels each evening. 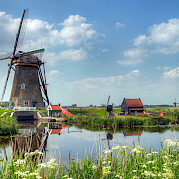 All of our bike tours in Holland can be found here Holland Bicycle Tours can be found here. 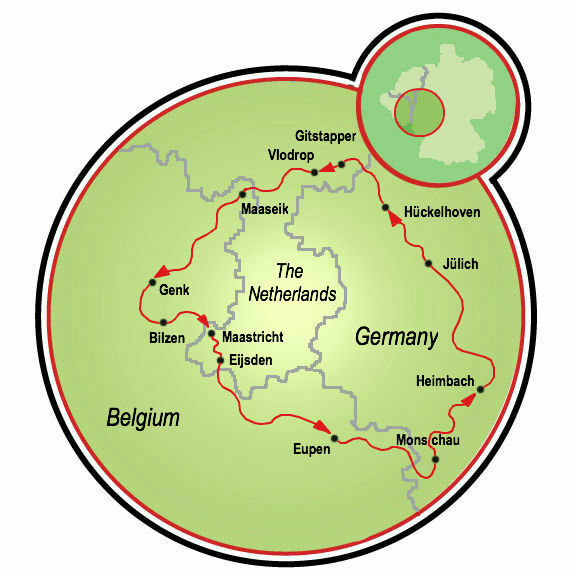 Similarly, our Belgium Bicycle Tours and Germany Bicycle Tours are listed here. Fly into Amsterdam Shiphol International Airport. 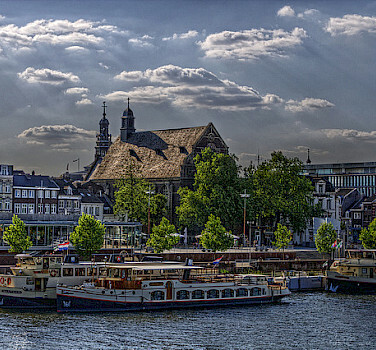 Train from airport to Roermond, bus or taxi to the hotel (about 15 km). Check local conditions prior to arrival. Average temperature in degrees Fahrenheit for the area: June 69/52º, July 72/56º, August 71/55º, September 66/52º, and October 58/45º. Accommodations in 3 or 4 star hotels. We can provide you with a sample hotel list. Just ask. Please note: August 25 arrival is not possible. Today's route contains some hills, however today will have less kilometers and the High Fens offers beautiful natural scenery. The gradual climb to 650 m N.A.P. is rewarded with gorgeous sweeping views. From here, you’ll have a descent to the exquisite German town of Monschau (400 m N.A.P. 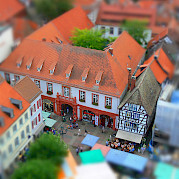 ), historically a center of wool, cloth production, and trade. 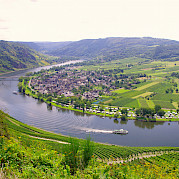 In the morning you will continue to enjoy the wealth of natural beauty that the Eifel region has to offer. The River Rur will be your guide today, winding down to the ‘Flachland’ below. The German cycle paths are well-maintained and mostly far removed from road traffic. On the route to Düren you will encounter a series of friendly villages. This tour is run by DutchBikeTours. My third trip booked through Tripsite.com and my third wonderful summer of biking! Three years ago, We traveled through Provence Villages. Last year through Slovenia and Croatia, and this year through Three Counties - Netherland, Belgium and Germany. 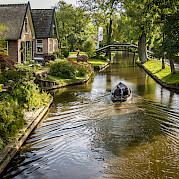 We have LOVED each of these explorations: countrysides, villages, forests, inns, seasides, agriculture, architecture and delicacies. The days were never dull, they were not too difficult, they filled us with a sense of peace and joy. We completed our trip in Europe excited to dream of where our next Tripsite adventure might take us! Hello some feedback from our bike trip to better the experience. We had a flat tire and the bike pumps didn't work. We were in a group of four and none of them worked. Also there were no tire tubes! Should we have taken some with us? If so I didn't read that suggestion in the info provided. On the bike trip from Dresden to Wittenburg we did a couple of years ago we were sized to our bike by a nice gentle man who took the time to explain aspects of the bike and we appreciated his efforts. We didn't have that attention this time so wondered if the bikes actually were road worthy, especially when we came to facing a fairly challenging route. The feed back from the Read more… bike shop in Huckelhoven was that the man caring for the bikes or owning the bikes was not as committed to his responsibilities to do so.. Just a comment they passed on and I am passing on to you. We do appreciate the ease with which to book these bike trip through emails on line etc. the hotel people along the trip were so friendly and accommodating and made us feel very welcome.